Kirkby Stephen is the main town of the Upper Eden Valley, in what was Westmorland and now Cumbria. 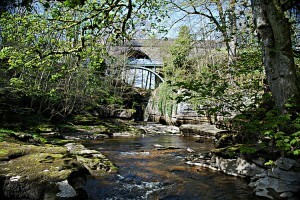 It lies at the point where the River Eden emerges from the limestone uplands of Mallerstang and starts to wend its way over sandstone along the peaceful pastoral valley towards Appleby. The town welcomes walkers and is a popular overnight stop-off on the Coast to Coast route.